Happy New Year 2014! I would like to thank you all for keep visiting my blog! Let start the year with a beautiful model, a Daisy Box, designed by Flaviane Koti. Great for Valentine's Day! 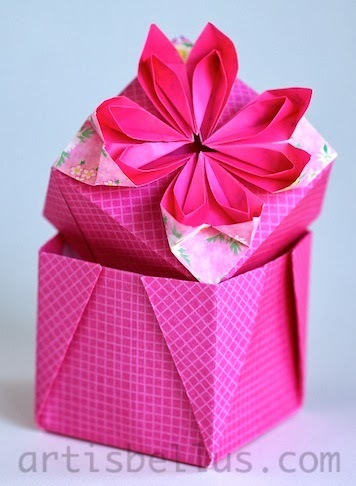 The instructions are available in the book Origami em Flor , by Flaviane Koti and Vera Young. The Daisy on the top of the lid has four pockets and the lid has four tabs, so no glue is required for the assembly. The flower is a modular design, and is folded with two 3" x 6" (75 mm x 150 mm) rectangles of duo origami paper. The lid and the base of the box are folded with one square of 6" (150 mm) scrapbook paper each. Copyright © 2010-2014 Marcela Brina. Powered by Blogger.